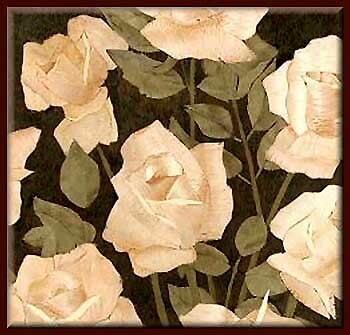 I'm sure that quite a few readers would like to make a flower picture using marquetry. One problem with flowers and foliage is that the shaping of the petals and leaves can end up looking rather flat and lifeless - more wooden than organic. In Figure 1 on the left, below, you can see this in a piece of Sweet Chestnut. Compare this with Figure 2 (on the right), where the leaves and petals of a rose were made from carefully selected quilted maple and willow veneers. The difference is quite startling. When you use those quilted veneers, make sure that you observe the orientation and direction of the grain in the veneer you are using, because you do not want to make your flower look unnatural. Observe the flow of the veining in the leaf or petal you wish to depict, and try to replicate that with your veneer grain. Place the veneer behind the "window" (see the second paragraph under the heading Construction in Lesson 4), and turn it until the right effect is achieved. This can be quite dramatic: the quilted veneers can give an almost 3D look to the finished flower, whereas the Sweet Chestnut version seems almost devoid of life. 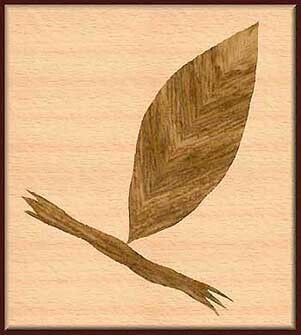 It is this attention to grain pattern and figuring that can turn a commonplace marquetry picture into a veritable masterpiece. My thanks to my old marquetry guru Horrie Pedder for allowing me to use a section from his picture "Roses and Butterfly" in Figure 2. Horrie doesn't use any sand shading or bleaching to achieve his effects. It is all done by careful veneer selection alone. This is a technique that provides a reasonably controlled darkening of sections of veneer in order to obtain shaping and shadow that cannot be obtained from just veneer selection alone. The idea of sand shading is that you just tint the wood - you are not attempting to carbonize it and reduce it to ashes. You just want to darken it a little. If you want to have a really dark section in your picture, don't resort to sand shading. Just select a darker veneer and cut that in. Sand shading, if judged correctly, can provide you with a gradated transition from light to dark which gives you a very useful fade into shadow. You can use this effect to show roundness and shaping in your marquetry pictures. Generally, you will find that sand shading only really works well with lighter colored veneers such as sycamore. Darker veneers don't show much change when you sand scorch them. They just lose their moisture content and become extremely brittle, and they crumble when you try to cut them. 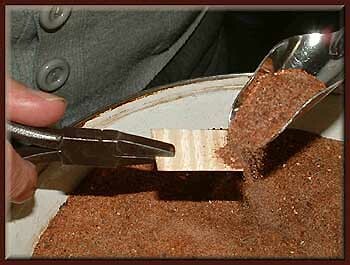 The photos below were taken at a sand scorching demonstration at the Redbridge Marquetry Group. Silver sand is the usual preference because it is reasonably fine and flows well, but as long as you use a clean dry regular sort of sand, it should suffice. Cover one to two inches depth in your heating dish: an old frying pan baking dish works well, as long as it's wide enough for your veneer pieces. The family stove can supply the heat, but be sure that you're the one who cleans up the spilled sand and burnt splinters! 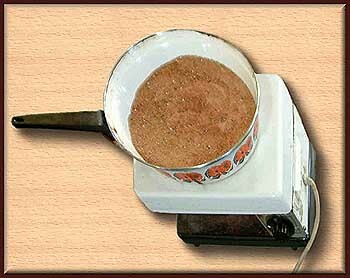 It might be better to invest in a stand-alone hot pad similar to the one seen in Figure 3, above. You could use a camp stove in a pinch, but they often lack the fine level of control that you find with a stove or hot pad. Keep an eye on the heat of the sand and keep testing it frequently, because you don't want to turn your carefully selected and cut piece of veneer into a chunk of charcoal the instant you insert it into the hot sand. That does happen. I did it myself in the early days, with an unregulated heat source. The next item you are going to require is a small shovel or trowel with which to apply hot sand to veneers which you are not going to immerse fully and scorch along the edge (more on this later). 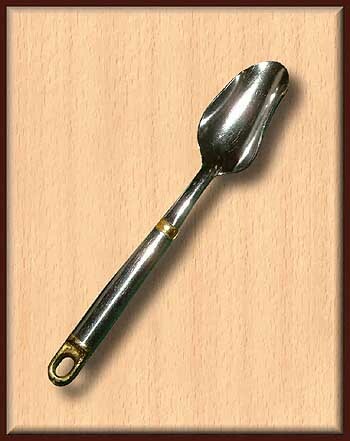 What you need here is a form of scoop that will allow you to control the flow of the hot sand. In the Figure 5 at left, I used a dessert spoon and bent the edges inward to take on the characteristics of a scoop. Purchase a single piece of cheap cutlery, so that I don't get blamed for advising you to ruin the family silver! Your last two pieces of equipment are a pair of pliers and a pair of tweezers for holding your various sized veneer pieces when sand shading. A couple of different sized versions of these tools would be helpful, but not particularly necessary as long as you are using medium sized implements. This will save burning your fingers. 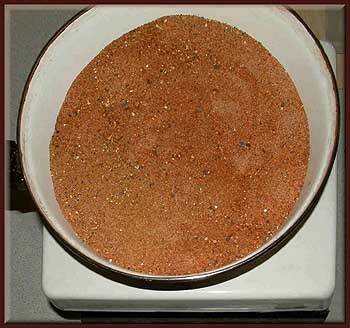 Place a reasonable level of sand in your container - about an inch or so is generally sufficient. Place your container on the heat source. Allow it to heat up gradually - 20 to 30 minutesis best. Check it often by cutting some small scraps of the veneer you want to sand scorch and place one of them about half an inch into the hot sand with your pliers (or tweezers if it is very small). Give it about 5 to 10 seconds in the hot sand and then remove it and see if it has scorched to the degree that you require. If it is too dark, then turn the heat down and allow it about ten minutes to cool slightly and repeat the heat test again until you achieve the level of darkening that you require. Obviously, if the scorching is too pale then you will need to increase the heat slightly, allow it 10 minutes and try the heat test again. Once your sand is at the correct temperature you can now apply it to your actual picture veneer. If you wish to darken it along one edge you simply place that edge in the hot sand, count five, take it out of the sand and see if it's darkened sufficiently. If not, give it another five seconds. If you wish to darken an irregularly shaped piece of veneer, then you will need to resort to the "spooning" method shown in Figure 6 at right, where you pour hot sand onto the veneer in order to achieve the results that you want. If you want a special shape to your sand shading, you will need to make use of some masking to achieve your effect. 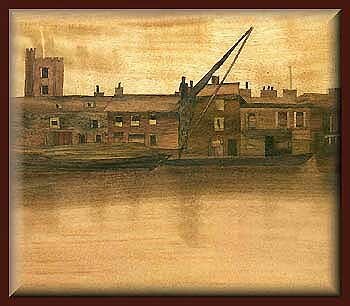 If you take a look at the reflections of the buildings in the water in my Barking Creek picture (Figure 7, at left), you will see the effect of masking and sand shading that I used in order to get a diffused reflection in the water - without having to resort to cutting in veneers and ending up with glue and cut lines spoiling the overall effect. When I spooned on the hot sand, I gave it about five seconds on the reverse of the veneer, then tipped it off and repeated the process until I achieved the depth of shading that I required. As you will see from the picture, I only needed a small amount of darkening in order to achieve the depth of coloring necessary for the reflections in the water. For this purpose, you will find that sand shading is the perfect method for achieving the desired results. Sand scorching can be done on either the front or back of the veneers. If done on the front the veneer will scorch quickly and must be controlled carefully. Scorching from the back will be more controlled. Well, we have taken a good look at the art of sand shading in this talk. Next session we will investigate fine lining and talk about bleaching and coloring veneers. Do enjoy your marquetry. See you again next issue.